In a large soup pot, saute onion until tender, about 4 minutes. Add garlic and ginger and stir for 1 minute. 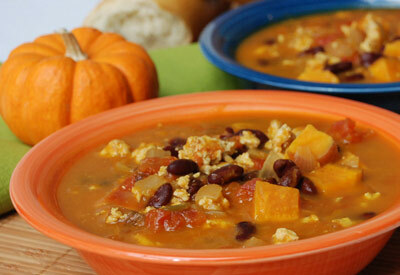 Stir in pumpkin, tomatoes with green chilies, sweet potato chunks and broth and bring to a boil. Reduce heat and cook over medium low heat until sweet potatoes are tender, about 15 to 20 minutes, stirring occasionally. Meanwhile, heat olive oil in large pan and brown ground turkey. Add cumin, salt, pepper and red pepper flakes to season the meat. Add cooked turkey and kidney beans to the soup and heat 10 minutes longer over medium heat.